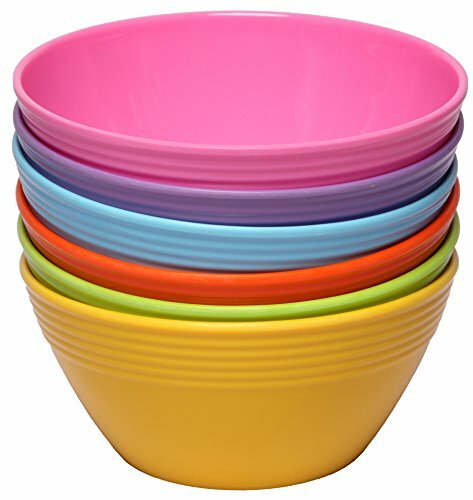 GREAT EVERYDAY SOUP/CEREAL BOWL SET: This 6-piece rustic melamine bowl set comes with (6) 18 oz bowls that are great for both indoor and outdoor use. The break-resistant design makes this a nice kids' melamine dinnerware set and also makes it ideal for camping or for use in RVs and trailers. 100% SATISFACTION GUARANTEE: We're happy when you're happy. That's why we've backed this colorful melamine dinnerware set with our total satisfaction guarantee. If you have any questions or issues with your set simply reach out to us and we'll do all we can to make it right. Click 'Add to Cart' now and start dining in style!